Found on the open waters and adjacent wetlands of the Chesapeake Bay and its tidal rivers. Also live on freshwater lakes and ponds throughout the Bay watershed. Visit the Bay region from autumn through spring, with a peak in November. 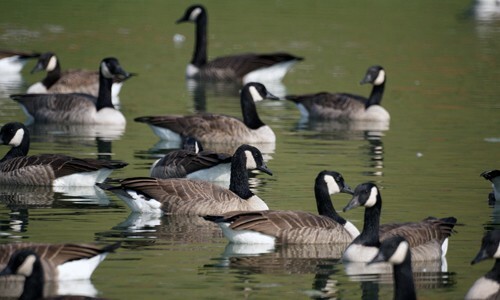 Begin to arrive in October and migrate back to northern breeding grounds between mid-April and May. The bufflehead is a small, chunky, energetic diving duck that visits the open waters of the Chesapeake Bay and its rivers from autumn through spring. The bufflehead has a small, chunky body, a short neck and a short, gray bill. They grow to about 15 inches with a wingspan of 24 inches. Males and females have different patterns and coloring. Males are mostly white with a black back. They have a glossy, greenish-black head with a large white patch on the back that looks like a bonnet. Females have a whitish-gray chest and a grayish-brown back, head and wings. They have a white patch on their wings and a small white smudge on their cheeks. Minks, weasels, hawks, falcons and bald eagles may prey on buffleheads. One bufflehead will usually watch for predators while the others in its flock dive for food. The bufflehead takes off by flying straight up from the water. This is different than most diving ducks, which run across the water’s surface before taking off. It flies low over the water and high over the land, and can be identified in flight by its black-and-white patterns and white wing patches. Usually silent during winter, when it is not breeding season. 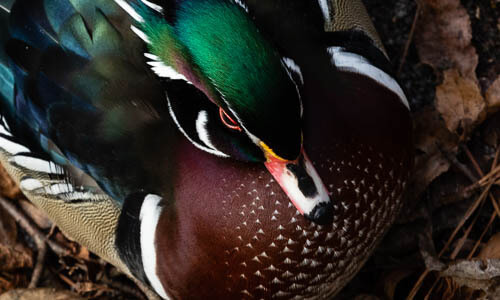 Males may make a hoarse squeak or squeal, and the female’s call is a weak, harsh quack. Buffleheads do not nest and breed in the Bay region; breeding grounds are located mostly in Alaska and northern Canada. Unlike most ducks, buffleheads are monogamous and stay with the same mate for several years. They can live as long as 12 to 15 years. Buffleheads are also known as butterballs. 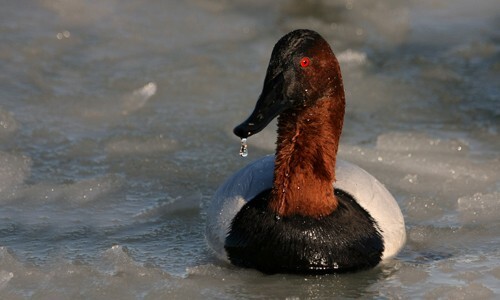 They are the smallest diving duck in North America. Buffleheads are constantly moving, either swimming along the water’s surface or diving underneath in search of food. Like other diving ducks, buffleheads are clumsy on land because their legs are located far back on their bodies.